An elk herd numbering about 20 animals rests near the Summit County Shooting Range in Dillon, Tuesday, April 2. 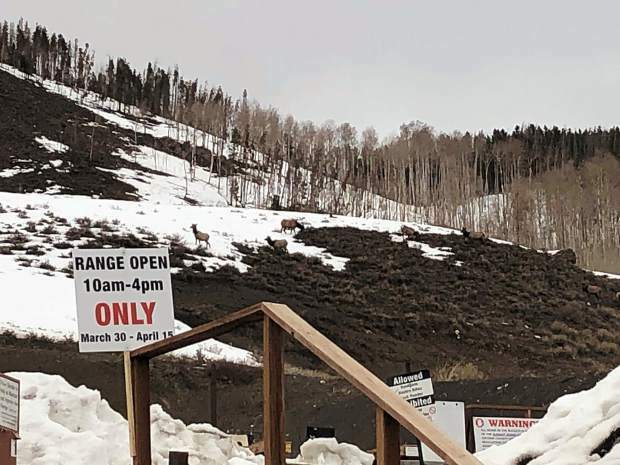 The Summit County Shooting Range’s decision to temporarily reduce hours to prevent disturbing a local elk herd has been lauded as a success by wildlife officials. The shooting range, located next to the Summit County Resource Allocation Park, started limiting hours after Colorado Parks and Wildlife officials spotted an elk herd near the range last week. During winter, elk have nothing to eat and live off of fat stores. Aside from hunger, the sound of gunfire was considered an extra stressor that could endanger the elk during their critical calving period. After hours were reduced over the weekend, district wildlife manager Elissa Slezak said elk have been seen resting comfortably near the range. The reduced operating hours — 10 a.m. to 4 p.m. ­— will be in effect until at least April 15, and possibly beyond depending on conditions. The normal hours for the range are 7 a.m. to 8 p.m. from April to October, and 7 a.m. to 5 p.m. from November to March.